Normally when I get a SCBS warning light I know it is the window needs to be cleaned. 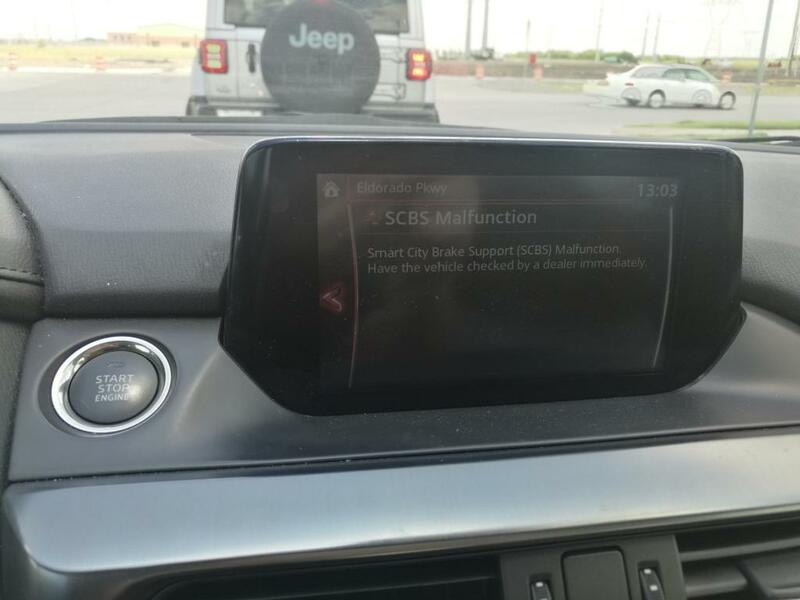 This time however when I got a SCBS malfunction it said something I had never seen before; "SCBS Malfunction - Smart City Brake Support (SCBS) Malfunction. Have the vehicle checked by a dealer immediately." I immediately stopped what I was doing and drove 1 hour to the nearest Mazda dealer. When I arrived I showed them the error message telling me to immediately return the vehicle to the dealership. The service rep looked at it and said lets go inside. So I turned my vehicle off which he said "I was hoping you were not going to turn off the vehicle." When we turned the vehicle back on the error message was gone. The dealer checked the codes and said there were no thrown codes to detect and that we would have to wait for the problem to return, bring it back and don't turn it off so we can scan the codes. I observed that no kind of other inspection of if the SCBS system was working. ( I guess I need to get some card board boxes and test this myself) They only scanned the codes and said to bring the vehicle back the next time it happens. They gave me a key to my card without any paperwork documenting this problem. I asked for an invoice to document that I had attempted to resolve this problem under warranty and show they were unable to find the problem. They told me it would be 30 minutes to get your paperwork and proceeded to help other customers who came in after me and made me wait. When I received the paperwork they incorrectly listed it as a CSBC malfunction instead of a SCBS Malfunction demanding that the vehicle be checked by a dealer immediately. The problem is not resolved and it is unknown when it will return. You would think that if Mazda is going to give you a warning message to take the vehicle to the dealership immediately they would be able to have better troubleshooting and diagnostics capability. When this happens again and I drive another 1 hour drive to the dealer and the light suddenly goes out again then Mazda can't fix this problem. A reminder, this was a different kind of SCBS Malfunction where it told me to take the vehicle immediately to the dealer. I am used to the other type of SCBS Malfunction caused by dirty windows and those error messages when they do occur don't tell me to take the vehicle to the dealer.